The perfect weekend hike for everyone! 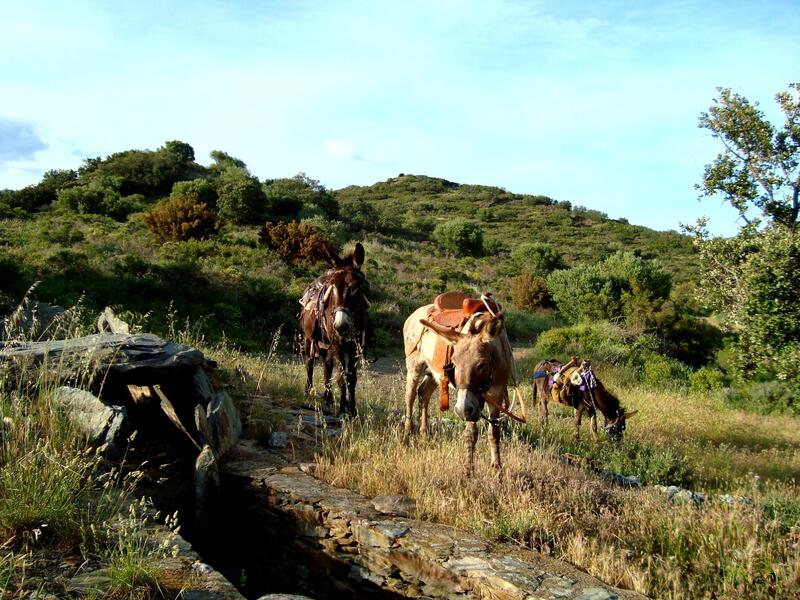 This donkey trek is the perfect weekend getaway for the whole family! Side by side with the donkey the trail leads through the Albera nature park, past menhir and dolmen. Thyme and rosemary, wild lavender: pure and authentic Mediterranean idyll: No noisy beach, but southern tranquility, perfectly complemented by a retreat on a small organic farm. Here you are served culinary tastings of local products. Enjoy! Whoever likes to live in close touch with nature can choose to sleep in a tent. As an alternative we offer a Casa Rural, a small, local guesthouse. The tour has a cozy character. We walk mainly on wide paths with little difference in height, so that the walk is easy and therefore also very feasible for kids. 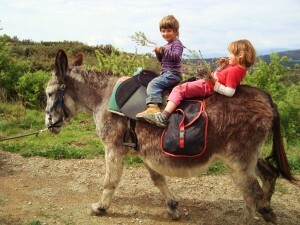 Most of the time kids can even ride on the donkeys! We begin our hike in the picturesque village Rabós. Here we meet our donkeys and get a briefing on how to handle and take proper care of them – after all, humans and animals should both feel comfortable with each other! Finally, we load up our long-ears and start our adventure. Our route takes us through the streets of Rabós, out of the village towards Espolla. We walk past vineyards and olive groves and enjoy these first impressions of the landscape. We cross Espolla and continue walking. It goes a little uphill, where a breathtaking view of the mountains is the reward for the effort. Soon we reach the Menhir de la Mutra, the largest menhir in the region. At this beautiful place we take a break and strengthen ourselves with a delicious picnic. After the break, we continue at a leisurely pace. 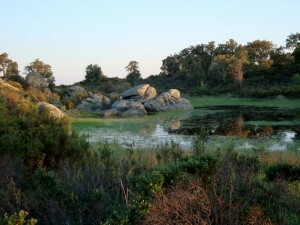 Accompanied by the scent of wild herbs along the way, we finally arrive at an “Estany” – a rain water pond – and pass a dolmen. This construction from the megalithic culture has the charm of the past and a touch of mysteriousness! Finally we reach our destination: a small, beautiful farm, close to which we pitch our tents – if you like, you can, of course, sleep directly under the stars! We enjoy the hospitality of the landlord and will be spoiled with some of their homemade delicacies. Before we reach our guesthouse in Sant Climent Sescebes we complement our adventure with a stop at a small organic farm. Here we get to sample the wines produced there and receive an insight into its production. After an extensive breakfast we are strengthened and ready for the return journey. 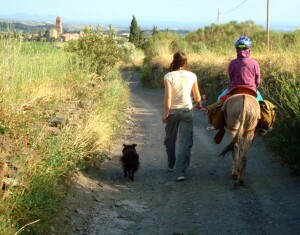 At the pace of our donkeys we walk towards Espolla and from there to the picnic area on the banks of the Orlina river. In the wonderfully refreshing water of the Orlina we have the opportunity to bathe! With a little luck and if we sneak up quietly we may even see turtles basking in the sun. After a delicious picnic and a relaxing siesta we get back on the trail. It goes uphill slightly and the route takes us past another dolmen to a pass. Before us stretches a picturesque valley and we have a wonderful view of the sea! After we enjoyed this place, it goes slightly downhill, past wild nature. The gurgling of the river accompanies us on our way back to Rabós where we will finish off this beautiful hike. 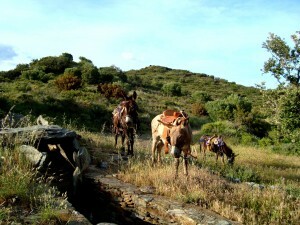 You have the choice of doing the hike on your own or to be accompanied by an experienced donkey and hiking guide. * Except in the hot summer months (July and August), the tour can be done all year around. In the colder seasons (November to mid-March) with accommodation option. The dates for a self-guided tour are freely selectable if donkeys are available.